Agomo has been updated with some exciting new additions! 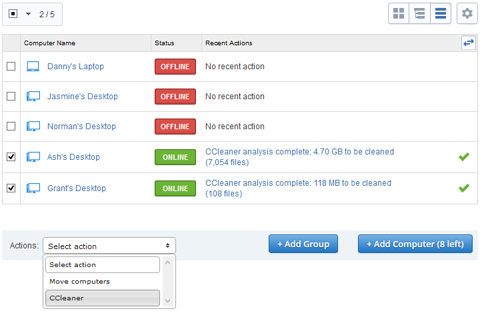 The latest version adds the ability to run CCleaner across multiple endpoints. This means you can now optimize all your computers with the click of a button! We've also added recent actions to the My Computers grid view so you can quickly see the last Analysis or Clean completed on each of your machines. On top of this, we've been working hard making significant efficiency and performance improvements to the Agomo Agent along with a host of admin and UI improvements. CCleaner for Android had been updated to version 1.10! In this release, you can now set Cleaning notifications so you'll be reminded if you have not run a clean recently. We've also added indicators to the App Manager to show which apps autostart or have background services running. On top of this, we've continued to make various stability and cleaning improvements!